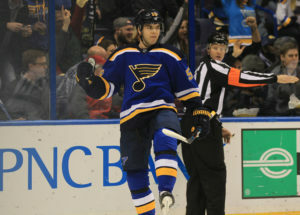 Vladimir Tarasenko and Alexander Steen scored third-period power-play goals as the Blues picked up a 4-3 win over the Vancouver Canucks on Thursday night at Scottrade Center. Magnus Paajarvi and Jori Lehtera also scored, and Kevin Shattenkirk had three assists for the Blues, who hvae won their sixth straight game. Jake Allen made 18 saves for the win. Mike Yeo made history with the victory. With the Blues improving to 7-1 since Yeo replaced Ken Hitchcock, it is now the best start for a coach in Blues history. The early part of the third period brought the most action. Tarasenko gave the Blues a 3-2 lead with a power-play goal 58 seconds into the period. The St. Louis powerplay has been slumping, one of the few things that haven’t gone well. It was the Blues’ first goal with the man advantage in four games. Steen’s power-play goal four minutes late made it 4-2. Steen has four goals and four assists and is a plus-4 since Yeo took over. Vancouver cut the lead to 4-3 just two minutes after Steen’s goal.